The 2019 NCAA Tournament field of 68 was announced on Sunday night with Duke taking the No. 1 overall seed and the ACC becoming the first conference in a decade to get three No. 1 seeds from the same league. The selection committee was kind to Belmont and Temple, less so to Alabama, TCU, Indiana and NC State. The Big Ten led all conferences with eight tournament teams, followed by the ACC and SEC with seven each. There are already some Cinderella favorites among college basketball fans looking for the No. 12 or No. 13 team most likely to win everyone's hearts in the first two days of the tournament and enough conspiracy theories with the matchups and location assignments to keep to the message boards buzzing for days until the action starts back. So lets get into it all, bit by bit, with some instant reactions to the bracket reveal. Oh, and don't forget to download your 2019 NCAA Tournament printable bracket here. 1. Do Sunday conference championship games really impact the final seeding? There has long been a creeping suspicion that the most impactful game results on Selection Sunday are the automatic bids handed out in potential or likely one-bid leagues. The idea being that by the time the SEC and Big Ten title games are tipped off, the selection committee has pretty much set its mind on the general order of teams at the top of the seed list. On one hand that could be encouraging if you want every game should be weighted the same in the eyes of the committee, but if there was going to be any extra boost for winning in the conference tournament final we would have likely seen it with Michigan State and Tennessee. The Spartans beat Michigan for the third time this season in the Big Ten title game and finished behind Tennessee, which lost in the SEC title game to Auburn by 20, on the selection committee's seed list. 2. LeVelle got his wish! During an interview with SportsChannel8 on Saturday, NC Central coach LeVelle Moton joked that he hoped the committee would make sure they didn't have to play Zion Williamson. Based in Durham, North Carolina, Moton knows the Duke program well and enjoyed the opportunity to both celebrate the Eagles tournament win and have some fun with a local audience. The call went viral, and now we see NCCU lined up in a potential path to meet the Blue Devils in Dayton, Ohio. Of course, they first have to win in Dayton. So let's not get too far ahead of ourselves. 3. Virginia Tech makes history: The Hokies are in the NCAA Tournament for a third straight season for the first time ever. Buzz Williams has done a tremendous job building up his program in Blacksburg, Virginia, and with senior guard Justin Robinson now cleared to return after missing 12 games with a foot injury, you can bet they'll be a popular pick to make it to the second weekend. 4. More from the "this can't be random file:" How about Richard Pitino and Minnesota facing his father's former employer Louisville in the first round? How about the potential Mike Krzyzewski vs. Johnny Dawkins matchup in the second round in Columbia, South Carolina? North Carolina and Roy Williams could clash with Kansas in Kansas City, Missouri, and oh yeah by the way, Kentucky is there too so we've got the potential for an Elite Eight reprise between the Wildcats and the Tar Heels. The selection committee defends its process and officially does not endorse the idea that juicy narratives are taken into consideration, but each year there's more evidence to suggest that they, like us, can't help wanting to see these matchups in the NCAA Tournament. 5. Gonzaga won't get respect in the conversation (from the public, at least): As the fourth No. 1 seed, the Bulldogs are going to relegated in the conversation behind the three ACC teams and even the two SEC No. 2 seeds. But look no further than the Las Vegas odds to win the NCAA Tournament, where Gonzaga is listed just behind Duke and ahead of North Carolina and Virginia in the post-bracket reveal update. 6. Cincinnati gets some home cooking ... as a seven seed: The most favorable seed-location combination in the field has to be No. 7 Cincinnati going to Columbus, where it will start action against No. 10 Iowa and, if it wins, have a chance to knock off No. 2 Tennessee in the second round. The Vols are very capable of traveling well and buying up enough tickets to have a presence, but if -- and that's a big if -- Cincinnati can beat Iowa it's going to be the second round upset alert we've all got our eyes on heading into the weekend. 7. Marquette vs. Murray State is the best individual matchup: The fact that the good folks in Hartford, Connecticut, will get to watch Ja Morant and Murray State go head-to-head against Markus Howard and Marquette is just silly. I'll be in Columbia with Zion Williamson and even I'm feeling some FOMO thinking about what it's going to be like when two of the most prolific offensive threats in the game are competing on an NCAA Tournament stage. 8. NC State reacts to getting snubbed: NC State is ranked No. 33 in the NET, No. 32 in KenPom, No. 26 in the BPI and No. 24 in Sagarin. 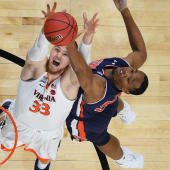 But it's nonconference strength of schedule was among the worst in the country, and its record against Quadrant 1 opponents not only knocked it out of the field of 68 but left the Wolfpack from even being included as one of the first four teams out -- all of which receive top seeds in the NIT. NC State athletic director Debbie Yow released a statement expressing her disappointment in the wake of a move to using the NET ranking over the RPI.